The SoundAsleep Dream Series Comfort Coil air mattress beats its competition pretty handily when it comes to reviewer enthusiasm because it gets just about everything right: Comfort, ease of use, and durability are all unparalleled, users say. This double-high mattress comes in both queen and twin sizes, and the queen boasts 40 internal air coils to bolster support. Inflated, it is 19 inches high. Reviewers praise the SoundAsleep mattress for several reasons, but one of the major pros was the fact that it doesnt’t leak air or sink overnight, a common problem with air beds. They also like the one-click dial inflation, which allows more control over how firm or soft the mattress ends up. Owners echo this praise, saying the built-in pump is convenient and makes it easy to put up and take down the bed. Many say the SoundAsleep has lasted longer than other air mattresses they’ve tried, and they say the waterproof flocked top helps keep sheets from slipping. Other features include integrated cord storage, a non-skid bottom and a carrying bag. The mattress is backed by a one-year warranty, and queen weight capacity is 500 pounds. If you prefer a lower-profile air mattress, the double-high Insta-Bed Raised Air Mattress is a bit shorter—18 inches to the SoundAsleep’s 19 inches—but owners are also enthusiastic about its comfort and features. There are also more options with the Insta-Bed: It comes in twin, queen, and queen pillow-top versions. The Insta-Bed has “Never Flat” technology that uses a secondary pump to fight sagging and maintain even pressure throughout the night, and most users agree that it does that effectively. It also has a flocked top similar to the SoundAsleep’s that keeps sheets from sliding quite so much. Reviewers particularly like the easy-to-use inflation pump, which has three pre-set firmness settings and an automatic shut-off. The queen bed has 35 coils to the SoundAsleep’s 40. It also has a one-year warranty, and the queen holds up to 500 pounds. A spare bed shouldn't cost a fortune. This model from the popular brand Intex provides comfort at an affordable price. This bed will inflate in 3.5 minutes with its built-in inflatable pump which makes set-up a breeze. It measures 20 inches from the ground so this is a low bed. Many reviewers commented that this is a good bed for the price. But some also chimed in that this didn't have as long as a lifespan as they hoped for because it tends to deflate after many uses. However, if you are looking for a quick, easy and affordable spot to rest this air mattress will do the job. 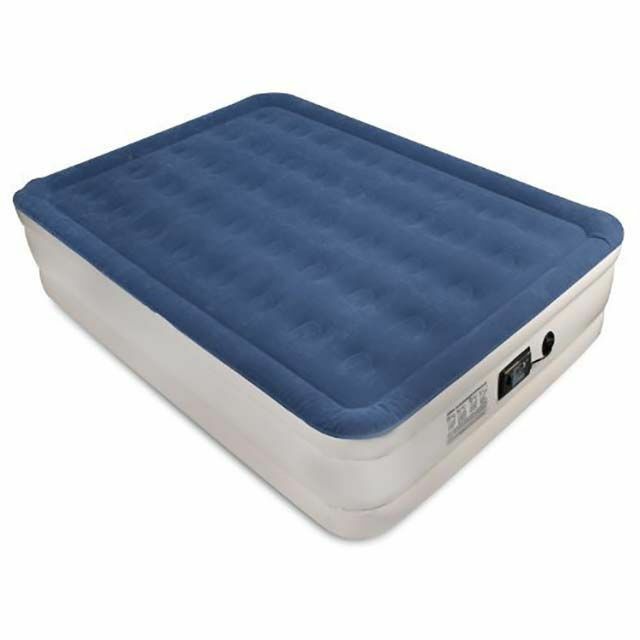 If comfort is at the top of your list when buying an air mattress look no further than this top-rated pick from King Koil. With this purchase, you'll get a raised air mattress which is a great option for elderly people or those who will be using this as a more permanent or long-term fixture in the home. It has a soft flocked outside that makes it feel soft — even without sheets — and has a built-in pillow. The extra thick quilted top provides ample support for your spine leaving you refreshed and rested in the morning. Set-up takes just 4 minutes so if you're using this for spare guests this won't take a long time to set up. All you need to do is plug it in and it will fill itself. Reviewers are thrilled with the overall comfort and look of this, with many stating this is the best air mattress they have ever bought. If you’re traveling with children — or having little ones come to visit — then this Active Era Air Mattress is a good option. It’s great for toddlers who aren’t quite ready for elevated hotel beds, or as a quick, easy-to-store sleeping solution for visiting grandkids. What makes this mattress so distinctive is the four-inch-high bumper around the edge that prevents children from rolling off in the middle of the night. The whole thing inflates to almost nine inches thick and comes with a 100-percent cotton (fully-washable) fitted sheet/mattress cover that conforms to the shape of the bed. The Active Era mattress inflates in less than 60 seconds, with final dimensions of 65 x 38 x 8.6 inches (it only comes in one size). And if your kids seem to want to test the durability of everything they touch, don’t worry — this mattress is made from hard-wearing, puncture-resistant material that can handle a toddler’s wear and tear. The double-high Insta-Bed EZ Bed Air Mattress is a good middle ground for buyers who are looking for the feel of a real mattress set without making that kind of investment. That’s because the 48-coil EZ Bed comes with a frame that gives it the feel of a real bed, boosting sleepers 22 inches off the ground, but it still packs away as conveniently as most other air beds. The EZ Bed comes only in queen size. Like the Insta-Bed Raised Air Mattress above, the EZ Bed also comes with the secondary “Never Flat” pump that monitors air levels throughout the night, adjusting as necessary. There are three firmness settings, and the flocked top helps keep sheets snug and secure. Owners particularly like not having to stoop down to get in bed, and some say it’s so comfortable that they even forget they’re on an air mattress. They also say setup is easy, despite the addition of the frame—you simply unzip the unit from its case, plug in the included pump, and watch it inflate. The storage case has wheels to ease moving the bed around, but a few reviewers caution that it does take up more storage room than a typical air mattress. The EZ Bed has a one-year warranty. Weight capacity is 500 pounds. If you’re in the market for a higher-end air mattress without a frame, this Serta with a quilted topper gets high marks from users. It comes in queen and twin sizes, and the removable topper helps eliminate that rubbery, clinical feel that most air mattresses have. There are also 35 built-in air coils to provide a more supportive feel. This Serta has a double-high mattress that puts users 18 inches off the floor – great for those who don’t want to stoop down too far – and a durable flocked top that is puncture- and water-resistant. The built-in pump takes only about four minutes to inflate the bed, and it automatically shuts off when it’s done. 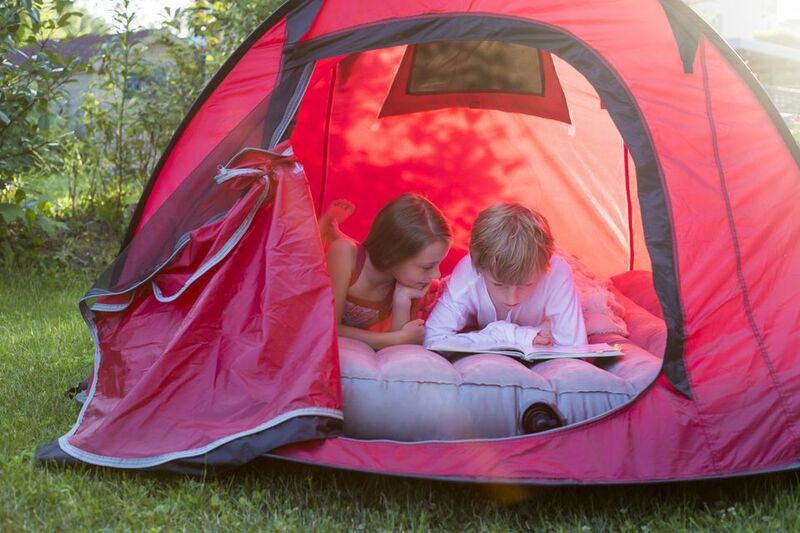 A secondary pump even monitors firmness throughout the night to prevent those uncomfortable air-mattress cave-ins. Most users say this mattress has provided many comfortable nights of sleep, but a few warn that their bed sprang a leak after tearing at a seam. For those who like to camp but not sleep on the ground, this folding cot provides you with a solid nights sleep off the ground, with ease. This mattress isn't restricted to camping many reviewers also use this in their guest room so out of towners feel a bit more comfortable than sleeping on the ground. When you are camping, no need to fear about finding an electrical source to pump this up — it comes with a battery pump and a carrying case so set up is easy. It also has two side tables so you can store a flashlight or your book without falling out of the bed. Reviewers are impressed with many saying the addition of a quilted mattress pad makes this bed an absolute dream. If you’re looking for an ultra-portable mattress solution for your next camping trip, the Etekcity Portable Air Mattress may be the way to go. It comes in both queen and twin sizes and is made from durable, extra-thick 0.35mm PVC that’s designed to handle the outdoors. This mattress does not have legs and it isn’t as elevated as many of the indoor options on this list (it’s only 9 inches thick). But reviewers claim that it’s still extremely comfortable, and its smaller dimensions only add to the Etekcity’s portability. The queen model, which inflates to a full 60 x 80 x 9 inches, folds down to a compact 13 x 15 x 7 inches and tucks into its own carry bag for easy transport. It can also inflate and deflate in just 60 seconds, making it that much easier to set up and break down your campsite. The top of this air mattress is covered in a flocked material for comfort (and to prevent your sheets or sleeping bag from slipping), and the bottom has an anti-skid base so it won’t slide around inside your tent. But perhaps the most standout feature of the Etekcity mattress is the rechargeable pump. With this model, you don’t have to worry about finding an outlet or forgetting to pack extra batteries — you can simply plug it into your car’s AC adaptor. And some reviewers claim to have gotten up to nine full inflations from the pump before needing to recharge. Our reviewers spent 30 hours testing a top-rated air mattress. To get the most comprehensive results possible, they inflated it, slept on it for nights on end, packed it up, and stored it. We asked our testers to consider the most important features when using this air mattress, from its comfort to its durability. We've outlined the can’t-miss points here so that you, too, know what to look for when shopping. Size You’ll want to think carefully about the size of your mattress in terms of its dimensions and height. If your kids will be using it, a twin will probably suffice. However, adults and couples will likely prefer a full or queen-size mattress. Duration of use Is your mattress going to be used for just a few nights, or is someone planning to sleep on it for an extended period of time? Some air mattresses tend to deflate slowly after a few uses, while others stay inflated for much longer, making them a better option for long-term use. Inflation method Most of today’s air mattresses have pumps to inflate them, which saves you the trouble of having to blow them up manually. However, check whether the mattress you’re considering needs to be plugged into an outlet or if it has a battery-powered pump; the latter is an essential feature if you plan to take it out into the wilderness. This air mattress came highly recommended by one of our testers, who used it on two separate weekend trips: “This air mattress was comfortable throughout the night,” she said, “and its surface is far better than the air mattress I've been using — I think that makes a big difference.” Our reviewers also thought that it was easy to store once deflated, and one loved that it had a built-in internal pump: “It’s one less item that I need to make sure I remember before I head out for a long weekend,” she said. On the other hand, our reviewers thought that it took longer than other air mattresses to inflate (though one tester posited that was because of its height) and also that it was heavier than comparable models.